How big Were the Mumakil? The movies portrayed them as massive beasts that resembled historical elephants only in shape, not in size. While Tolkien described them in letters 64 as “A large elephant of prehistoric size.” It appears the largest “prehistoric” elephant kind would have been the Proboscidea. However it is based on little fossil evidence of two thigh bones and unlikely Tolkien would even be aware of these estimates- but estimates say it could have been a massive 17.1 feet at the shoulder. Compared to a modern African elephant of 10-13 feet the shoulder and Asians avg of 9 feet. Below is a comparison of the African elephant with the 17 foot shoulder Proboscidea, a suggested maximum height. Human for scale. However the steppe mammoth is the largest of the woolly mammoth/elephant kind and is based on much better fossil evidence and regularly reached 13.1 at the shoulder with similar weight/size ration as modern elephants. One fossil found could have been 14.8 at the shoulder [max size not average]. Below is the scale of mammoths compared to humans along with modern African elephants, human just under 6 feet. To be lore accurate we are confined by Tolkien's stated “large elephant” and prehistoric size. This is still a massive elephant. People worshiped and thought divine the modern Indian elephant because of its size and strength. The average size of an Asian elephant is 9 feet at the shoulder. The massive African elephant is larger between 10-13 at the shoulder up to 4 feet higher at the shoulder. The Steppe Mammoth even lager at 13.1-14.8 feet at the shoulder. This is why I think the steppe Mammoth size of between 13.1 and 14.8 [max suggested from scant fossils] which would would be 113% as large as a maximum African elephant, is a good height for the mumakils and still within Tolkiens “large elephant” description. I think described with long tusks these beats should more resemble a steepe mamoths in not just size, but its features and have massive tusks. Below is a comparison of a steppe mammoth and a modern African elephant for size and features. The look of the Proboscidea above I think would be good as well just scaled down slightly in size. Followed by well known author Allen Lees depiction that resembled a mammoth. I think the movies tried as they often do the bigger= better presentation. But I think bigger is not always better and neither did Tolkien. It looses its sense of realism, reality, and its belivabilty in a historic time period that Tolkien so desired. Mumakil Big as a House? This came from a hobbit nursery rhyme and was not to be taken as literal as Tolkien said in letters 64. 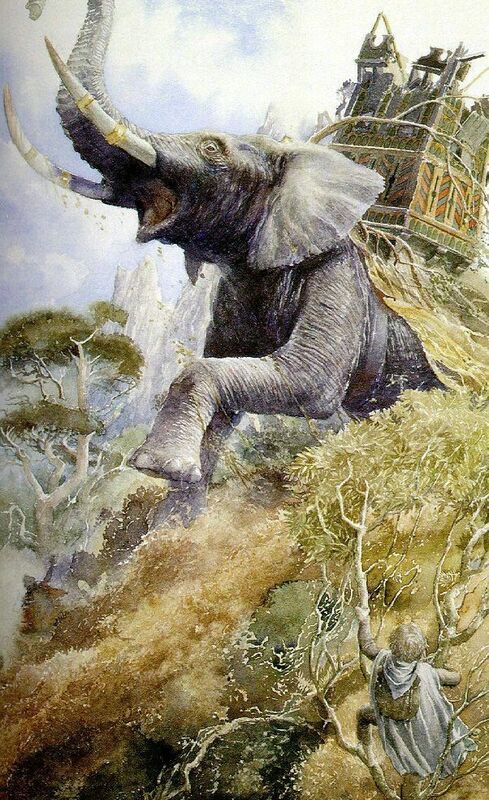 Tolkien also never saw himself as writing and his books need to be understood from the perspective of the character and their observations such as a hobbit seeing a massive elephant. Last edited by R.R.J Tolkien; 03-30-2018 at 08:32 AM. Big as a house, much bigger than a house, it looked to him, a grey-clad moving hill. Fear and wonder, maybe, enlarged him in the hobbit's eyes, but the Mûmak of Harad was indeed a beast of vast bulk. So Sam's standard of size comparison is qualified; still, the beast did have an actual tower on its back, as well as a "giant" warrior (7 feet tall, maybe? ), clinging to its neck and looking very small. With that, I don't think a shoulder height of 20 feet is out of the question. "Big as a house, much bigger than a house, it looked to him, a grey-clad moving hill. Fear and wonder, maybe, enlarged him in the hobbit's eyes,but the Mûmak of Harad was indeed a beast of vast bulk." So we can see from the text it is not saying the beast was bigger than a house, only that "it looked to him" and that "fear and wonder" enlarged the beast in the hobbits eyes. But that it was indeed a very large creature. This also brings up the question of the size of a house, we would assume sam would use his typical hobbit hole size house. I am unsure of the size of a hobbit hole, but would they be 30 feet high? if the oliphaunt is 20 at the shoulder like you suggest, i dont think so. Maybe. Right. But again, the animal did have the remains of a 'war-tower' on its back. How high would such a tower have been? depends on its purpose, which I would posit was for observation. So I would estimate a height of at least 10-15 feet for the tower. If that was approximately equal to the height of the creature's back from the ground, that seems reasonably effective for the purpose, as well as not being unduly unstable. Hobbits were said to have had a general dislike of heights, so most Shire-houses were likely one-story. Certainly the ones seem by Sam would probably have been on the smaller side, since the bigger houses seem to have been in the Eastfarthing where the majority of Stoors were located (not to mention Brandy Hall). Roof height of the 'normal' residential house in the Shire could possibly be around 15 feet. Yes it was large enough for a tower as were African and Asian elephants. I think being on the back of a large elephant alone provides the purpose of observation. A tower would add protection i think. I am not so sure how high it could be and stable upon such a beast. ...the Mûmak of Harad was indeed a beast of vast bulk, and the like of him dors not walk now in Middle-earth; his kin that live now in latter days are but memories of his girth and majesty. So we are talking about something *significantly* larger than a modern elephant. Beyond that it's hard to say exactly how large a creature Tolkien had in mind. My personal image is of something rather smaller than the movie versions, however. Perhaps it's a practical issue- I mean how would you tame those things in the first place? Perhaps it's a practical issue- I mean how would you tame those things in the first place? To quote a wise old sage, "size matters not". Why couldn't a giant beast be tamed as a smaller one: with food? Good post. I think that quote fits into tolkiens “A large elephant of prehistoric size.” But i am not sure it demands a "significantly" larger beast. Is this quote saying that the mumakil seen by sam is a smaller version of older descendants? than that would not tell us its size compared to a modern elephant. Since it reads that now walk on middle earth, thus its hard to conclude a comparison with modern elephants. Plus a mumakil the size of my op would be 161% times the size of an Asian elephant. No, the "now" is from the perspective of a later time (than that of "Lord of the Rings"), and the Mûmak described as "a beast of vast bulk" is what Sam saw (or its kind). That really seems to me the only natural reading. The entire point of that passage is to tell the reader, "hey, this thing was even bigger than modern elephants"
Big as a house, much bigger than a house, it looked to him, a grey-clad moving hill. Fear and wonder, maybe, enlarged him in the hobbit's eyes, but the Mûmak of Harad was indeed a beast of vast bulk, and the like of him does not walk now in Middle-earth; his kin that live now in latter days are but memories of his girth and majesty. Not very helpful for a precise estimate of size, though: "It was really, really big... in fact it was bigger than really really big... OK maybe it wasn't *that* big... but then again, it actually was really, really big..."
So, 'prehistoric' is naturally a bit ambiguous. But a source I rather respect for scientific accuracy has this estimate of what seems to be reasonably Oliphaunt-like. The possible shoulder height of this creature was about 16ft. I always felt Sam's description lined up fairly well with the movies and this never bothered me.